For the facing page I wanted some kind of map showing my favourite walk, a perfect day for me is to catch the launch from Keswick over to Hause End, walk up through Manesty woods to the footpath which climbs up to the ridge of Catbells. Climb up to the top where the view is just breathtaking, looking across to Skiddaw or over the other side to Newlands Valley, down the other side to the duck boards which cross the marshy ground at the end of the lake before catching the launch back from Lodore to Keswick. I pondered about stitching an actual map, but the scale was all wrong, or embroidering the route…when a comment from Kate Chiconi about inchies made me think, this would work in inchies. 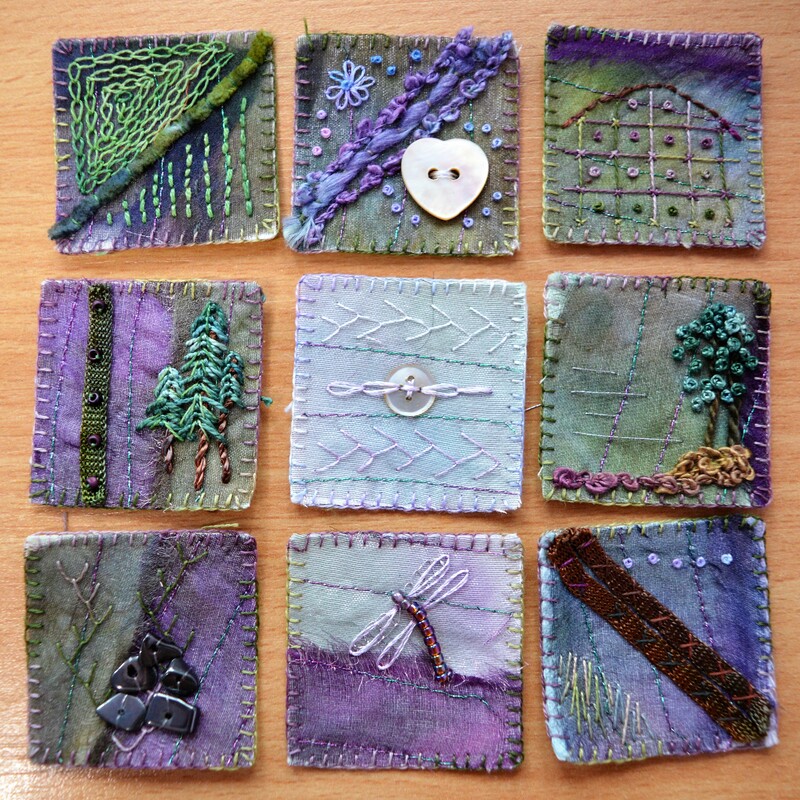 So I have stitched nine inchies to represent the different aspects of the walk. 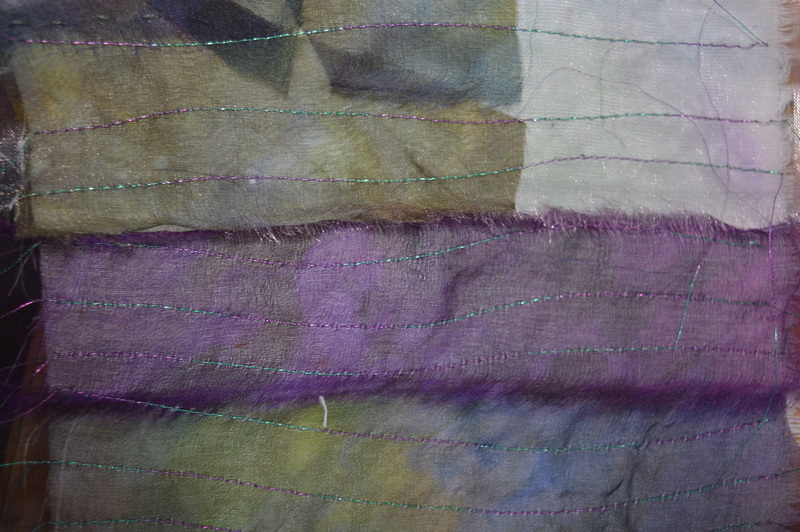 I had just scraps of the catbells chiffon left, so I positioned everything I had on some cotton with a strip of the Derwentwater organza. I needed to stabilize them somehow so I decided to use some fusible interfacing on the back before stitching with a machine embroidery thread, I just did curvy lines down, hoping they could vaguely look like contour lines. I decided to cut inch and a halfies, an inch really does look small!! I used my die cutter and then blanket stitched round. A couple were a little short on the chiffon (they were just scraps I had left!) but I found a little bit of watercolour paint covered it up. First to be stitched was Newlands Valley, this lies on the other side of Catbells and I’ve always loved looking down at the field patterns when they’ve harvested the crops, so I just used a couched length of chenille yarn as a wall or hedge, with chain stitch and back-stitch for the fields. Keswick took a bit more thinking, I wanted to include a heart button as I just love it there, all my childhood holidays and holidays in my early twenties were spent in Keswick so I have many happy memories there. In the end I couched two types of yarn to represent the River Greta which runs through the centre of Keswick, together with some flowers for the lovely parks. Skiddaw is the mountain which dominates any view of Keswick, it’s over 3,000′ but when you walk up Skiddaw it is just a big grassy hill. It took me three tries to embroider this one. The first was with fly-stitch to show all the fells that make up Skiddaw, they’ve got lovely names like Dodd, Little Man and Latrigg. It didn’t work, so I tried beads, that was too harsh, so I decided to play on the idea that it’s just a big grassy hill to climb. I stitched a grid of longstitches and then held them in place with tiny cross-stitches. The french knots just help fill it in a bit and add a bit of texture! Manesty Woods skirt the base of Catbells so having caught the launch to Hawse End, we walk up through the woods to the main ridge path. I remember it being mainly larch so I embroidered some fir trees and then stitched some viscose ribbon with beads to show the main ridge walk. Derwentwater is a beautiful lake, no speedboats are allowed so it’s very peaceful, it’s also the only lake in Cumbria (I think) that you can walk all the way round the shore. There’s an excellent launch service with around eight landing stages, I think the boats are the original ones probably from about 1950. The embroidery is stitched with detached chain over the button and feather stitch either side. I decided this is the frothy wake which follows the launch. Friars Crag is probably less than 15′ high, it’s a rocky promontory just along from the landing stages at Keswick. It’s a lovely gentle walk after dinner, watch the sunset over Catbells before strolling back to the hotel. I used straight stitch and french knots for the tree, added some curly yarn for the crag and a little silver for Derwentwater. Catbells is only little as fells go, just 1480′ high, but it holds it’s head high amongst it’s loftier neighbours as it has the exhilaration of climbing a mountain without too much height. As readers of Beatrix Potter will know, Catbells is also the home of Mrs Tiggiewinkle, the hedgehog. My friend and I climbed Catbells very early one June morning and sat on the top to watch the sunrise, an amazing experience. Three decades later I climbed Catbells with friends to celebrate my 50th birthday, a fantastic day. On the top of Catbells is a small cairn so that’s what I stitched with some flat beads. I stitched feather stitch behind it as once you get near the top there are lots of different routes to scramble up. I think the duck boards inchie is my favourite. The duckboards are wooden planks that cross the marshy ground at the end of Derwentwater. If there’s been a lot of rain and the lake is high then they are impassable and you have to walk into Grange village instead. The boards are two planks wide with passing places every so often. As a child I used to love crossing them as the reeds seemed enormous and there’s lots of colourful dragon flies flitting around. I used beads for the body and initially blanket-stitched the wings in silver thread. It wasn’t quite enough and I remembered the silk threads I bought on ebay recently. They are very fine with a beautiful gloss, a lazy-daisy stitch worked perfectly. Lodore is where we catch the launch back to Keswick. The landing stages are all wooden, it’s amazing how the crew manoevre the launch so close to the shore. The launches must be pretty flat bottomed, but if the lake is low they do sometimes have to close a landing stage, or just stop at the end, rather than along side. At Lodore there’s lots of reeds near the landing stage but there’s also a flat beach area where we used to skim stones, five was considered a reasonable skim, hence the five french knots. So that’s my favourite walk in inchies, I just need to mount them all in the Travelling Sketchbook, with a few words too, before posting it to Australia. Once I’ve completely finished my entry, I’ll write a post about the whole sketchbook. I’m linking up the Kathy’s Quilts for Slow Stitching Sunday, a celebration of all types of hand-stitching. Why not follow the link and have a look what everyone else has been stitching. 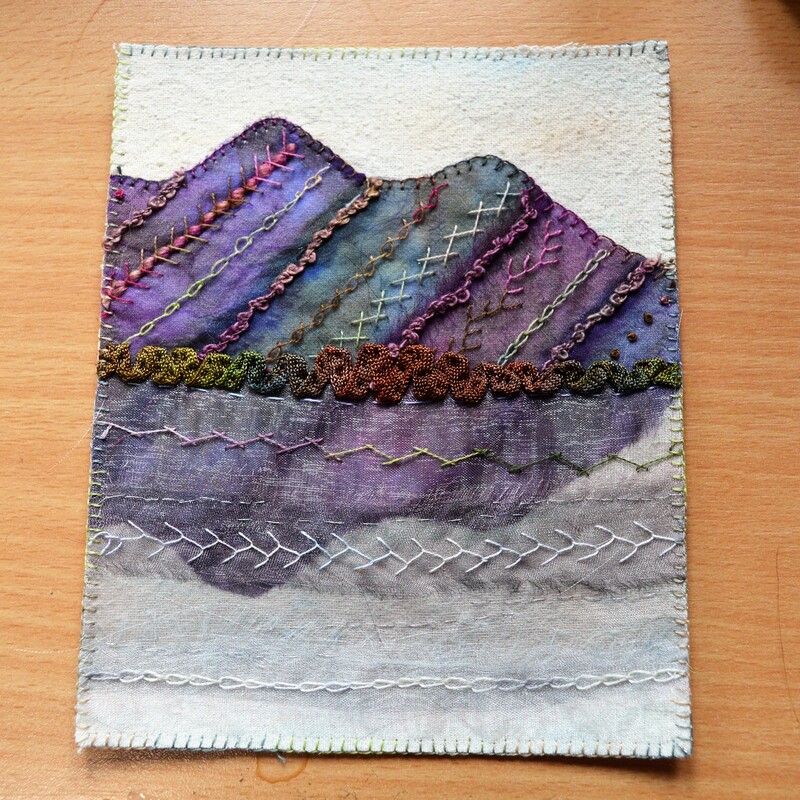 This entry was posted in embroidery, Serendipity, The Travelling Sketchbook and tagged Catbells, embroidery, Inchies, The Sisterhood of the Travelling Sketchbook. Bookmark the permalink. Oh, I love them all!!!! And the colours…. so delicious!!! 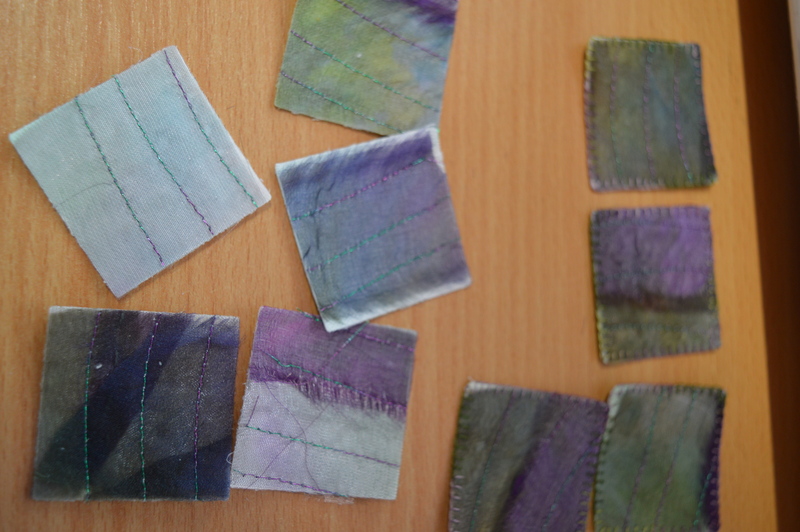 Thanks Faby, I always like a green and purple colour scheme! Wonderful, and inchies was the perfect solution to the route map; you’ve encapsulated all the important features, the things you love and the beauties of the area. They’re fabulous, truly beautiful, congratulations on a real achievement! Thanks, I thought inch and a half was small to work on, so just imagine inchies!!! This is such a wonderful project. Your inchies are gorgeous! Thank you! It’s been a lovely project to be involved with. This is spectacular! 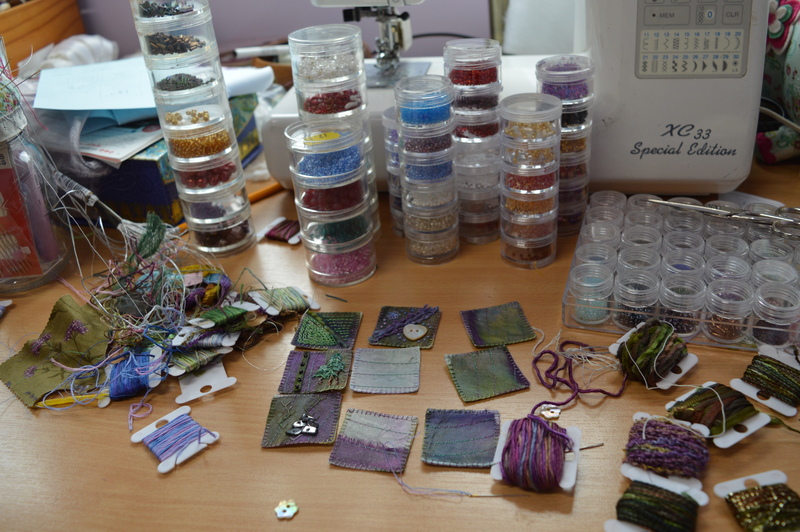 I really love that photograph of your work surface and all the creativity going on there! Enjoy your stitching! These are cool! You really have captured a sense of place with your colours and textures. You do realize Margaret, that now you are on the list for every traveling sketch for the next 25 years?.i want a sketch book, just so you can put something in it!!! I’m going to add that to my list!!! love your work.. Have you read abut the 2020 challenge on Pintangle? Thanks Kathy, I hadn’t heard of that one, it sounds a great project but I think I’ve probably got enough on at the moment, I’m following it in case I change my mind in a couple of months time!